Issho Benkyo - Always a student ! I am learning Karate-do for 31 years out of 35 years of my life. 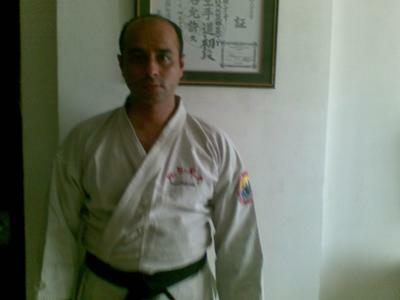 My early training has been in JKA Shotokan at YMCA Dojo, Kolkata, India, which was started by Sensei Anil Sinha, legend of Indian Shotokan. Sensei Sinha, currently GM in IFC (World Bank Group) is a former student of Enoeda Sensei and former All British Universities Champion. In those old days, YMCA Wellington Branch, the base of JKA West Bengal, was the crucible of learning for us, with repetation, constant grilling, a military fanatical pace of training and an unforgiving Sensei, who pushed us hard and harder. 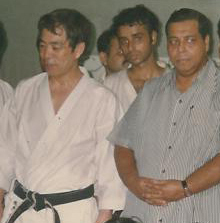 Sensei Sattrajit Chaudhury, Sensei Gokul Dutta, Sensei Doshi, Sensei Pradeep Sharma, Sensei Salil Burman and Sensei Purandar Sarkar were my teachers, they groomed me up, toughened me in JKA Shotokan and have been instrumental in shaping my interest in Karate-do. Sensei Sinha, who had relocated outside Kolkata, used to come intermittently, transmitting the Samurai-like JKA Shotokan ethos in us. 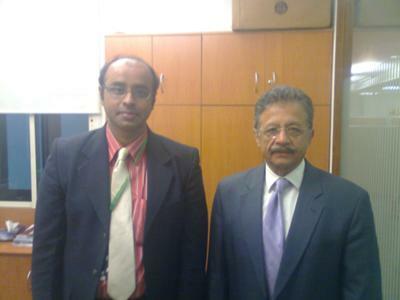 Photo: With Sensei Anil Sinha, JKA India Chairman and my lifelong inspiration. After training under renowned JKA Instructors from JKA Japan - Sensei Sasaki, Omura, Imamura, Shiina, Yoshitaka, I slowly began to understand that Karate-do is more mental and spiritual. I failed 2 times in my Brown belt exam 2nd Kyu and only after a gruelling kata and kumite session where Sensei literally brought out my best, I was declared successful. I gradually developed concentration, confidence and became determined to achieve greater satisfaction and tranquility through training. In those years of 1980 sand early 90's, I also trained under Sensei Kanazawa & Murakami many times. Sensei Kanazawa's technical approach, deep breathing, dynamic techniques, text-book accuracy, perfection of character and his down-to-earth humility had a mesmerizing effect on myself. Also during those days we were encouraged to train under different instructors and Sensei told us that since we had achieved 2nd Dan by then, it was time for the real serious training. It was 1997 or 1998 when we had Pemba Tamang Sensei, Former JKA Instructor and now NSKF Chief as our visiting Instructor from Japan. Pemba Sensei, one of the first non-Japanese to achieve Kenshusei from JKA is a direct protege of Yahara Sensei and trained under Asai Sensei, Tanaka Sensei, Ueki Sensei and Abe Sensei. The product of these all-time greats can well be imagined and Pemba Sensei's dynamic Jion kata or his sharp Bassai dai epitomizes the unconquerable spirit of Shotokan Karate-do. He took me under his fold, fine tuning my performance and pushing me further. After qualifying as a Chartered Accountant and completing my MBA (Finance), I travelled abroad for professional assignments. During my overseas trips, I was fortunate to have trained under Okazaki Sensei, Yaguchi Yutaka sensei and Ochi Sensei in USA and Europe. In London, I trained under Kawasoe Sensei . This was possible for my frequent international business trips for my Business Consulting work. One of the golden opportunity came when I trained under Asai Sensei, Yahara Sensei and Kagawa Sensei. The JKS approach is one of the deadliest and practical.. I feel so lucky to be trained and graded under the Japanese Shihankai.. It was a new world of Karate when I trained under ... Sensei Hitoshi Kasuya, 8th Dan WSKF in 1997. Sensei Kasuya, a former JKA Instructor and protege of Nakayama Sensei and Kanazawa Sensei, is a pragmatic, focussed teacher, a hard task master and epitomises innovative rotary techniques in Shotokan. His serious approach, dynamic techniques and Budo-spirit appeals to me the most. He is always approachable, clears all our doubts, practices on the floor with students and has totally hands-on approach. In many seminars that I have trained under his guidance, he was always offering something new to us - Karate perfection is a moving target! The complex kihon , loaded with rotational tai sabaki & sudden counters which is his forte, seemed so difficult to us.. Sensei explained the deep philosophy of Shotokan, Funakoshi Sensei's Niju-kun and implored us to train harder. He leaves us spell bound each time and thus we develop, in body and spirit, a march towards perfection in all we do. Photo: With Kanazawa Sensei and Yoga Master Actor Mr B Ghosh, 1997. I am a business consultant in the area of Capacity Building, Change Management, Risk Advisory and Corporate Training & Development. The path is tortuous, slippery and demands tough, collaborative, flexible and open mind to learn, unlearn where needed and continuously develop and bring about holistic improvement in organisations. Karate-do has brought me where I am today and for me life is Karate and Karate is life. I only lament that the old Masters of our style are getting older in their 80's and some in their 90's - some have already passed away. The demise of Senseis Nishiyama, Enoeda, Asai, Shoji, Okamoto, Tabata, Yamaguchi Toru and others have created a vacuum, which is almost impossible to fill. I go to our beloved old YMCA JKA Dojo sometimes. Sitting there, looking at the old worn-out makiwara, the dojo, I miss the old Budo training when Karate was always regarded as a martial art first. With changing times, maybe the sporting aspects and flexibility in training have become the order of the day. I strongly recommend karate-do training for all youngsters and schoolchildren as well as corporate executives for the holistic improvement which dedicated training fosters. I slowly realize that the Dojo-kun of Karate-do is the foundation of success in all walks of life. My motto thus, is Issho Benkyo - "always a student". Comments for Issho Benkyo - Always a student ! What is "do"? Please explain the other jargons. It is indeed a pleasure to read Arijit's article which is written with humility and strength. Very Good article I will surely ask my students to read it. Its very inspirational and well represented in short. Join in and write your own page! It's easy to do. How? Simply click here to return to Karate Stories.